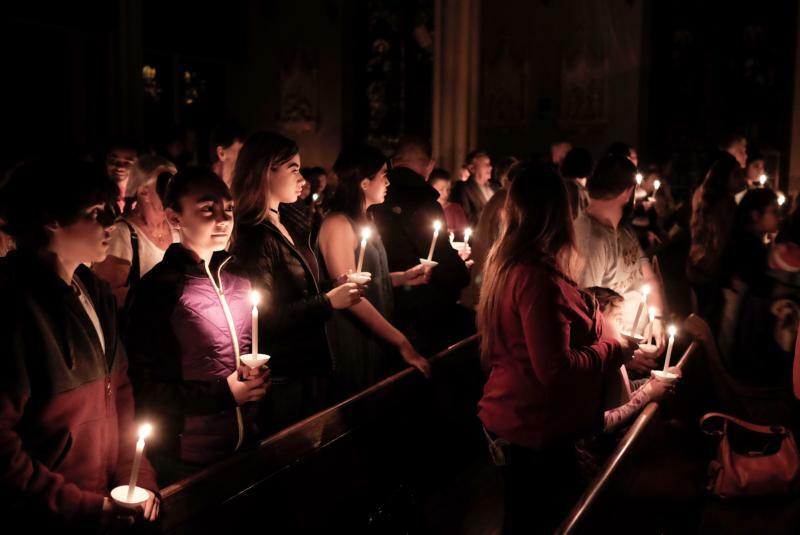 WASHINGTON (CNS) — During what the Roman Missal describes as the “mother of all vigils,” the U.S. Catholic Church welcomed thousands of new Catholics at the Easter Vigil April 15 in churches big and small across the country. About 60 of the nearly 200 dioceses in the United States reported numbers of catechumens and candidates entering the church in 2017 to the U.S. Conference of Catholic Bishops in Washington. Catechumens receive the sacraments of initiation — baptism, confirmation and first Communion — during the Easter Vigil, having prepared for this moment through the Rite of Christian Initiation of Adults. Candidates, who are already baptized, also go through the preparation program to receive confirmation and first Communion to enter full communion with the church. The Archdiocese of Los Angeles, the largest diocese in the United States, welcomed 1,756 catechumens and 938 candidates, while the Archdiocese of Galveston-Houston reported 1,667 catechumens and 708 candidates. The Archdiocese of Seattle had 679 catechumens and 409 candidates, the Archdiocese of Miami had 524 catechumens and 214 candidates, and the Archdiocese of Washington reported 483 catechumens and 698 candidates. Not far behind was the Diocese of Brooklyn, New York, which reported 387 catechumens and 528 candidates. The Tablet, Brooklyn’s diocesan newspaper, said that the numbers of new Catholics entering the church and those seeking full communion in the church were so staggering that the diocese had to hold two different ceremonies for the Rite of Election in early March. On Holy Saturday, at the Basilica of Our Lady of Perpetual Help in Brooklyn, the “greatest and most noble of all solemnities” took a little longer than usual this year. In addition to the dramatic symbols of light and the seven Old Testament readings, 52 catechumens and 25 candidates were welcomed into the church. In the Diocese of Rochester, New York, the RCIA involvement of Dan and Michaela Cady — along with their sons Aidan, 15, Solas, 12, and Merritt, 10 — was spurred by a family tragedy. Two years ago, their daughter and sister Kennis, then 12, died unexpectedly. “It just turned our heads about life,” Dan Cady said. He added that his family was grateful for the support it received from the staff of St. Jerome Parish in East Rochester, and from there opted to pursue RCIA. Dan said he was confident that his daughter was watching over the family as they continue on their faith journey. “We would like to think it’s orchestrated by her,” he said. Some of the family members received the sacraments this year, and others will next year. Overall, the Diocese of Rochester this year reported 96 catechumens and 149 candidates. Elsewhere in New York state, the Diocese of Rockville Centre reported 232 catechumens and 327 candidates; the Diocese of Buffalo had 56 catechumens and 105 candidates; and the Diocese of Syracuse had 49 catechumens and 70 candidates. Jarrid Perusse of Most Precious Blood Parish in Oviedo, Florida, said that while he was in Orlando, Florida, he “got saved on a porch” during a summer internship as a door-to-door salesman. He realized that God was reaching out to him, and “it was my turn to start reaching back,” Perusse said. In the Diocese of Grand Rapids, Michigan, 175 catechumens and 249 candidates received the sacraments. Among them, Mac, 90, and Barb Harless, 85, joined the church this Easter after finding their parish, St. John Paul II Church in Cedar Springs, Michigan, to be a source of prayer, peace and hope during Barb’s battle with cancer. Other archdioceses reported the following totals: Archdiocese of St. Paul and Minneapolis, 201 catechumens and 623 candidates; Archdiocese of Philadelphia, 235 catechumens and 322 candidates; Archdiocese of Louisville, Kentucky, 227 catechumens and 279 candidates; Archdiocese of Oklahoma City, 290 catechumens and 368 candidates; Archdiocese of San Francisco, 174 catechumens and 207 candidates; Archdiocese of Newark, New Jersey, 499 catechumens and 693 candidates; and the Archdiocese of Dubuque, Iowa, 63 catechumens and 94 candidates. In California, the Diocese of Stockton welcomed 284 candidates and 532 catechumens; the Diocese of Oakland, 176 catechumens and 376 candidates; the Diocese of San Diego, 333 catechumens and 635 candidates; the Diocese of Fresno, 593 catechumens and 56 candidates; and the Diocese of San Jose, 496 catechumens and candidates. In Florida, the Diocese of St. Petersburg had 456 catechumens and 514 candidates; the Diocese of Orlando, 586 catechumens and candidates; and the Diocese of Palm Beach, 147 catechumens and 474 candidates. Other dioceses reporting hundreds of catechumens and candidates included: Diocese of Dallas, 945 catechumens and 1,230 candidates; Diocese of Little Rock, Arkansas, 252 catechumens and 324 candidates; Diocese of Fort Wayne-South Bend, Indiana, 187 catechumens and 208 candidates; Diocese of Salt Lake City, 273 catechumens and 153 candidates; Diocese of Trenton, New Jersey, 200 catechumens and 508 candidates; Diocese of Charleston, South Carolina, 160 catechumens and 317 candidates; Diocese of Bridgeport, Connecticut, 78 catechumens and 241 candidates; Diocese of Jefferson City, Missouri, 106 catechumens and 172 candidates; Diocese of Tucson, Arizona, 111 candidates and 209 catechumens; Diocese of Youngstown, Ohio, 97 catechumens and 130 candidates; Diocese of Worcester, Massachusetts, 114 catechumens and 101 candidates; Diocese of Manchester, New Hampshire, 95 candidates and 67 catechumens; Diocese of Belleville, Illinois, 54 catechumens and 120 candidates; the Diocese of Duluth, Minnesota, 11 catechumens and 69 candidates.